The LANCOM Battery Pack is the ideal emergency power supply for business-critical LANCOM network components. Should the power supply fail, up to two connected LANCOM routers or access points remain powered up for at least two hours. 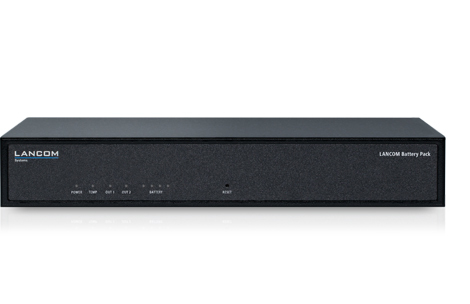 This means that LANCOM routers at IP-based exchange lines, along with any analog phones or alarm systems connected to them, remain functional even in emergencies. The LANCOM Battery Pack provides at least two hours of power to two LANCOM devices with a bayonet connector (access points, routers). Especially for critical applications such as alarm systems, the power supply remains uninterrupted even during outages, and analog phones or hazard notification systems connected to LANCOM routers remain in operation. If the general power supply fails, the Internet remote station (DSLAM) is often affected too. In combination with LANCOM LTE/4G routers, the LANCOM Battery Pack is ideal for implementing highly available Internet connections: When a power outage occurs, an LTE/4G router powered by the Battery Pack simply connects to the Internet via LTE/4G. A serial connector is used for monitoring the LANCOM Battery Pack status (current battery level, charge cycles, fan activity or device temperature) by means of LANmonitor or the Large Scale Monitor. This provides an instant overview of how long network operations can be maintained without power, or when the Battery Pack needs recharging. In emergency cases, the administrator receives alerts about events such as power failure or low battery charge via e-mail, SYSLOG and SNMP. Administrators can react to incidents quickly and avoid extended periods of downtime.